TAIPEI, Taiwan, May 8, 2012 /PRNewswire/ -- Boeing (NYSE: BA) and Taipei-based EVA Air today finalized an order for three 777-300ERs (Extended Range) airplanes. The order also includes purchase rights for an additional four airplanes. "The 777-300ER is the flagship of our long-haul fleet and will play an important role in growing our global operations," said Chang Kuo-wei, president of EVA Air. "The highly efficient, technologically advanced airplane will enhance the premium flying experience for passengers and will also allow us to open new destinations around the world." The Taiwan-based carrier is in the midst of growing its airplane fleet to increase frequency to mainland China and new destinations in North Asia. The new airplanes will help the airline position itself as the preferred premium airline in Taiwan. 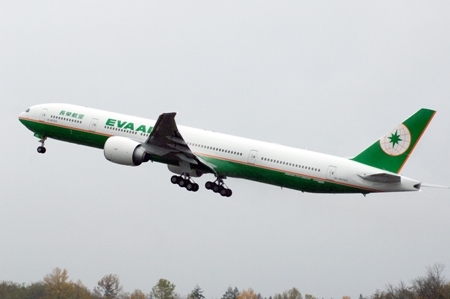 "We are honored EVA Air has again chosen the 777-300ER to expand its long-haul fleet," said Ray Conner, senior vice president of Sales and Customer Support, Boeing Commercial Airplanes. "EVA Air was a launch customer for the 777-300ER in 2000 and today the airline is among the leading global airlines operating out of Asia." The Boeing 777 is the world's most successful twin-engine, long-haul airplane. It is 19 percent lighter than its closest competitor, produces 22 percent less carbon dioxide per seat and costs 20 percent less to operate per seat. The 777-300ER seats up to 365 passengers in a three-class configuration and has a maximum range of 7,930 nautical miles (14,685 km).